We have long loved the bottom up sweater. 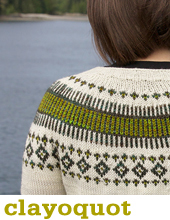 For a pullover you work 3 tubes, attach them all together and the knit a yoke. For a cardigan it’s 2 tubes and a rectangle. Simplicity at it’s finest! The only problem is that pesky seam at the undearm, so here is a little step by step on closing it up. All the sweaters from Heart on my Sleeve are worked from the bottom up! The underarm stitches from the body and the sleeve are on hold on waste yarn and there is a long tail from the sleeve. You will use the tail to work the Kitchener stitch seam. Insert needle tips or double pointed needles into the held stitches on each side; the needle tips should be on the side where the yarn tail is as you will begin seaming from that end. Thread a blunt darning needle with the long tail from the sleeve and use Kitchener stitch to seam the live stitches together. Note that there are still little holes on either side of the completed seam. Use the darning needle to stitch up the hole. Then weave the yarn across to the other side and do the same to close up the last hole. Voila! A nice neat underarm seam has been completed! 1. The underarm stitches from the body and the sleeve are on hold on waste yarn and there is a long tail from the sleeve. You will use the tail to work the Kitchener stitch seam. 4. Thread a blunt darning needle with the long tail from the sleeve and use Kitchener stitch to seam the live stitches together. Note that there are still little holes on either side of the completed seam. 5. Use the darning needle to stitch up the hole. Then weave the yarn across to the other side and do the same to close up the last hole. 6. Voila! A nice neat underarm seam has been completed! The problem is that the live stitches grafted together leave holes that the author suggest be darned. That works but I prefer to Kitchener the whole shebang. There are side stitches on the corners of the mouth. Pick up one stitch on each end of double pointed needles, both needles, to add 4 total stitches. The working yarn will be one stitch from the end so move it where it should be. Thread that working yarn onto a nice blunt needle and bring it through the picked up stitch closest to it. Then continue on with the Kitchener graft. It looks pretty and is regular. I was wondering how many stitches should there be for the underarm? I’d like to adapt the bumble to better fit my 10 year old and am makinx xs sleeves but am planning to make an S body. that means I’ll only have 5 stitches on hold for underarm, instead of 11. would it be OK to do increases one round before I put them on hold just in the underarm area? or would that look messy? Hi Christina – you definitely need a matching number of underarm stitches on the sleeve and body so they can be grafted together at the very end. I think you would be better off just putting 11 sts on hold for the sleeves as well as the body. Thank you! 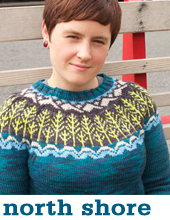 My armpits are always like… the armpit of the sweater! ;-) Just a detail, but when you say, “Use a darning needle to stitch up the hole”, what kind of stitch? This is where I just go for it and it often looks gnarly. Should one be trying to use mattress stitch? Or…? 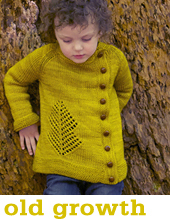 JUST WONDERING IF THE OLD GROWTH SWEATER AN BE MADE WITHOUT BUTTONS!!! ??? I LOVE ALL THE PATTERS AND THE SIZING! THANK YOU! KNIT ON!!! !